Vegetable tarts are very popular in Liguria. They were probably invented due to the need to use up leftovers, mixing them with something that could make the unusual combinations of ingredients go together, therefore, almost any kind of vegetable is used. 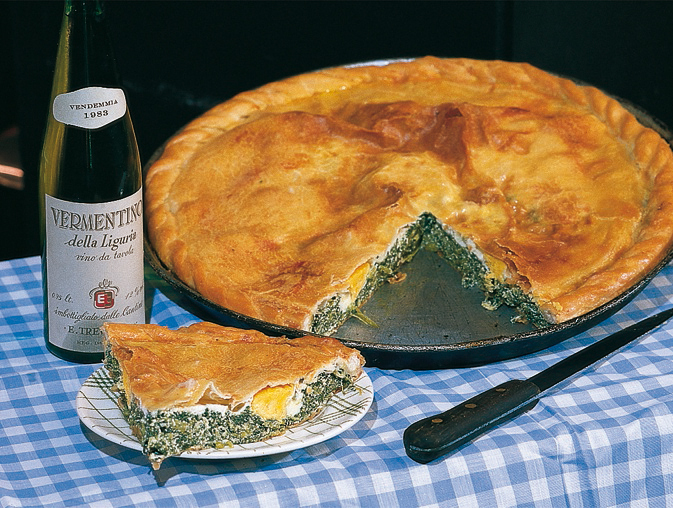 Yet the most well-known tart in Genoa is undoubtedly the Torta Pasqualina, now famous throughout Italy and beyond. extra virgin olive oil, salt and pepper. and chop. In a sauce pan, brown the chopped onion and garlic, add the chard and cook for 10 minutes. Pourinto a large mixing bowl and mix with the eggs, 80 g of parmesan cheese and the chopped marjoram. Drain the prescinseua well, mix with 2 spoonfuls of flour, 2 spoonfuls of oil, 20 g of grated parmesan cheese, then season with salt and pepper to taste. Now that the ingredients for the filling are ready, prepare the base of the tart. Take 13 balls of dough one at a time, and flatten with the mallet, making them as thin as possible, then make them thinner still by hammering with a greased fist until they become translucent. Grease the bottom of a tart pan and arrange the 13 leaves to form the base, brushing each with oil, except for the last one. On top of this layer place the Swiss chard and cover with the curdled cheese. Make six indents with a spoon and place an egg in each, with a little salt. Now flatten the remaining 20 balls of dough and arrange them over the top of the filling, greased on both sides, and try to keep them separate from each other by blowing air under them through a straw can help keep them apart. Ensure that the layers adhere well at the edges, and then roll inwards to make a crust round the edge. Brush the surface with oil and place in a pre-heated oven at 180 - 200°C for about 50 minutes until the tart appears golden with a crispy crust. 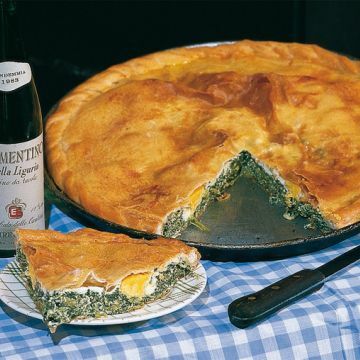 Another variation of the Torta Pasqualina is the Torta Cappuccina: this tart is prepared with the same ingredients, but instead of keeping the vegetables, eggs and cheese separate in the filling, they are all mixed together, If you want to experiment with different fillings, the Swiss chard can be replaced with artichokes, cut into thin slices and fried with oil and chopped onion, and ricotta can be used instead of prescinseua curdled cheese.